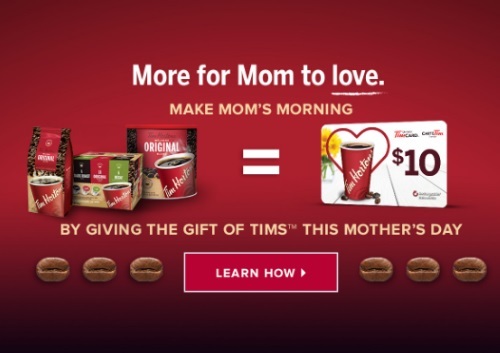 Mother's Day is almost here and Tim Hortons has a new special offer! Get a Free $10 Tim Hortons gift card when you purchase 3 eligible Tim Hortons products at participating grocery stores! 1. Purchase 3 eligible Tim Hortons products at a participating grocery store from May 2-30 2016 and take a photo of the receipt. Please note all three products must be purchased at the same time and appear on the same receipt during the valid period of the promotion. All submissions must be received on or before June 30, 2016. Each gift card request must be submitted separately. Allow 4-6 weeks for delivery of plastic TimCard.